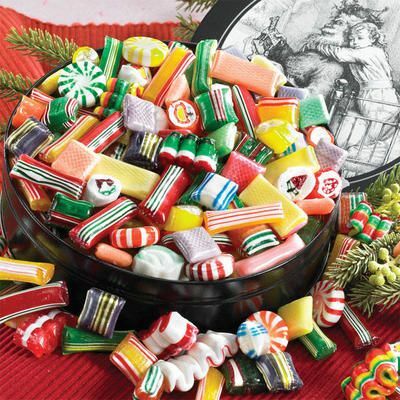 Old fashion hard candy is a must have candy for Christmas. For many it is not just the candy they have to have , but it is the memories it provides. I think everyone remembers eating this candy as a kid at grandma's house. So it's quickly becoming a tradition that is carried on from past generations. Then there is the ribbon candy. It is available in either thin ribbon or baby ribbon. Fruity very thin candy shaped like a ribbon or baby ribbon which is a more chunkier piece of ribbon candy. I can't forget to mention my all time favorite and that is cut rock candy. I love the fruit and spice flavors, but what appeals most to me is the design in the middle. No matter which of the old fashion Christmas candy is your favorite mix them all together in your candy dish and they just look almost to pretty to eat. Here is a cute story I would like to share with you, that one of my customers told me a few years ago. When her grandmother passed away, she inherited the Christmas candy dish. So every year she buys 2 cans of hard candy and 2 cans of the filled to put in her candy dish so it feels like grandma is sharing Christmas with her family. The part that I found really cute was that her kids do not like this candy , which most kids don't. So after the first of the year she ends up throwing away most of the candy that was placed in the dish. Yet year after year she buys the candy that reminder her so much of her grandma, without it she said Christmas would not be the same.